Two brothers from Australia Corporal Frederick Furnell age 30 (Australian Light Railway Operating Company) and Lieutenant Gilbert James Furnell age 25 (Australian Pioneers) meet for a visit not far behind the line on the Western front. They are killed by a random shell. Captain Cyril Linton Verso (Australian Infantry) is killed at age 27. He is the son of the Reverend Canon Jacob Verso Vicar of Berrigan New South Wales. Second Lieutenant Michael Hole (King’s Royal Rifle Corps) is killed at age 39. His brother will be killed in December in the sinking of the Aragon. Chaplain Elijah Cobham MC (attached King’s Africa Rifles) dies of wounds received at Mihambia in German West Africa at age 37. He was the Vicar of All Saint’s, Bristol. Private Horace James Stokes (Western Ontario Regiment) is killed at age 39. His son was killed in April of this year at age 16 serving in the same regiment. 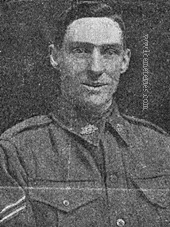 Bombardier John Williamson (Royal Field Artillery attached Trench Mortar Battery) is killed at age 28. His brother was killed in February.